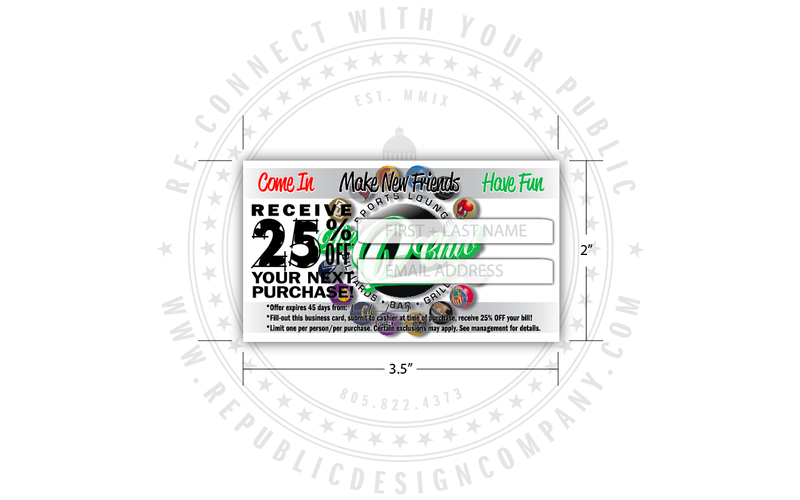 RE-connect with your PUBLIC… REPUBLIC! Of all the marketing collateral pieces at your disposal, a custom business card is one of the most effective ways to leave a lasting memory in the minds of potential clients. A cleverly crafted card will not only sum up your services and skills, it’ll also serve as a reminder of a face-to-face meeting and provide that personal touch so often lacking from digital communication. Make your name clear, as well as what you do. The purpose of your business card is to leave a lasting impression of quality, class, and trust: it doesn’t matter how many intricate creative elements you incorporate – if the design consists of your name in six-point type with a mix of caps and lower case, and the tag-line: “Master of all creative solutions in the media ecosystem,” it’s of no use to anyone. Use gimmicks sparingly. In general, complicated cut-outs, the use of unusual materials, fold-up models and so-on are best left for mail-outs and other marketing collateral. Think about your message: will using silver ink really help communicate what you do? DO NOT FOLLOW A TREND JUST BECAUSE EVERYONE ELSE IS! Carefully consider each and every design element, and ensure it adds real value to your message. It sounds obvious, but make sure you include every way in which you want people to contact you. These should, ideally, include a phone number, email address and website – don’t just throw on your twitter feed and hope people will track you down. Also (of course), make sure you regularly check those points of contacts. Tardy replies don’t install confidence in prospective clients. Your choices of typeface are critical for giving out the right message about your company, so think carefully. You generally only need two typefaces, (if that). A common error is to use too small a point size – if this seems to be happening then your probably trying to cram too much information onto the card. Keep that data for your website, blog, twitter, newsletter, and so-on. Don’t clutter your business card design. you need to make sure your message speaks loudly and clearly to your recipient. One pro tip is to leave at least a modicum of clear space for people to scribble on by hand. Business cards are used as ad-hoc note-taking devices all the time, particularly during those all-important first meetings or networking events. You want to give people every chance to look twice at your card. Depending on your client spread and whether you regularly attend industry events, exhibitions, and so-on, consider having two different sets of cards: one more traditionally plain; and perhaps one showing more experimentation. You can then match the type of card to the type of client your likely to be meeting. Without getting too Patrick Bateman (of American Psycho fame about it all, ensure you use a decent quality of card stock (or whatever other medium you’ve settled on). Talk to your printer about the different techniques and materials available, and discuss what minimum weight you’re likely to be able to get away with before the price starts ramping up considerably. Any decent printer will happily help. The most successful cards are the ones that are memorable, so once you’ve followed the golden design rules here, it’s time to think about added impact. The back of a business card offers a fantastic canvas to make your card stand out from the rest, so think about how you can use it in a way that’s relevant to your services or of use to the recipient. It could be a place for tips or loyalty stamps, or to provide an insight into your style, for instance. Ready? 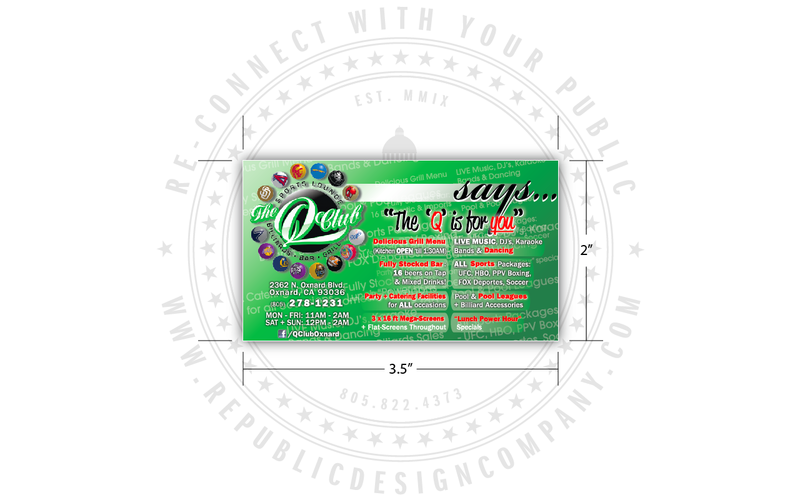 Set… Call us today to discuss your next Custom Business Card design + production project. With the help of Javier Ordoñez and Jonathan (“Johnny Savage“) Avila of Basic Space Studio; the dynamic duo filmed and edited this mini documentary and helped Republic Design Company bring this project to fruition. Now-a-days, having a website isn’t enough. The power of video across thee Internet is rapidly becoming a formidable tool that all businesses should employ if having a web presence is vital to a company’s viability. The SEO (Search Engine Optimization) opportunities and capabilities of having a video profiling a (your) company is near astronomical. Please view, share with your audience, and contact us for opportunities to collaborate on mutually beneficial projects. 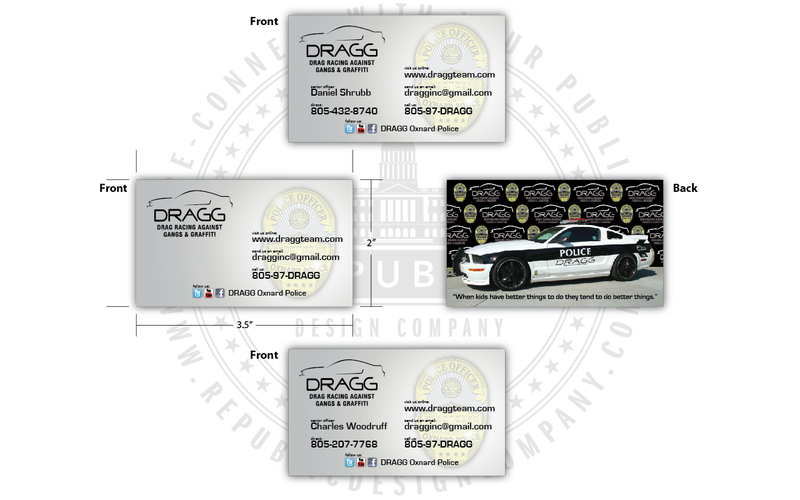 DRAGG Oxnard Police commissioned Republic Design Company for the design, implementation, and production of their latest round of business cards. Senior Officers Charles Woodruff and Daniel Shrubb of the Oxnard Police Department created DRAGG, (Drag Racing Against Gangs and Graffiti). DRAGG is a hot new program here in the city of Oxnard where officers along with people from the automotive industry, help reach out to the youth of today. DRAGG provides a viable alternative in the automotive industry and helps guide and mentor our youth. DRAGG’s goal is to reach out to high-school Juniors and Seniors through after-school programs, field trips and special events. It’s a new spin on an old idea, “keep the youth focused on the future,” with trained and experienced individuals in the automotive industry and in-partnership with the Oxnard Police Department. Three sets of business cards were created. One for each police officer, and one for general information. 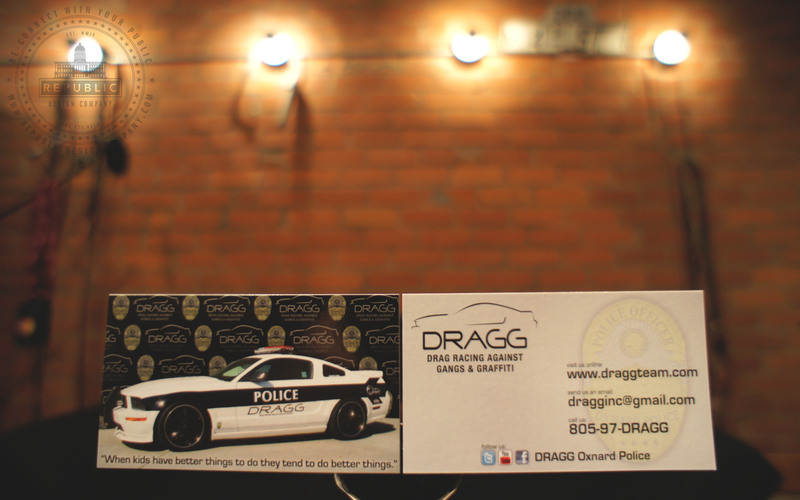 Contact information and social media icons were placed accordingly including the DRAGG logo in the upper-left-hand corner and Oxnard Police Department “badge” as a water-mark. 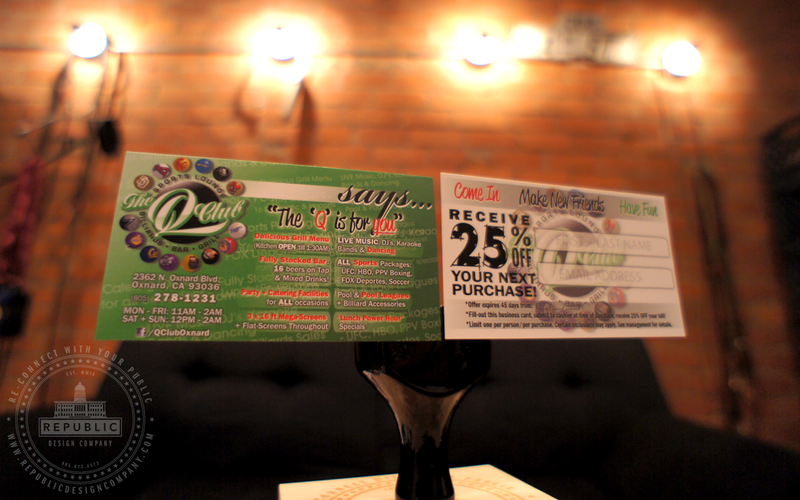 The back of this marketing collateral piece is designed with the objective of increasing the Q Club Oxnard’s email database with the allure of not only a 25% discount off your next purchase*, but the ongoing inclusion of special offers that are going to be made available exclusively to email database subscribers! *This special offer can NOT be duplicated or replicated off this or any website.